There is not a session goes by where myself or one of my trainers does not utilise the suspension training kit in the gym. I strongly believe that the suspension system can improve every piece of the fitness jigsaw (strength, endurance, power, flexibility, mobility and rehabilitation) and I use every opportunity to get my clients using suspension equipment. I have used suspension straps with a wide range of clients from absolute beginners, athletes of many different sports, people looking to increase muscle size and clients in the rehabilitation process. One particular client who achieved great things with the help of suspension training springs to mind; this client had severe osteoarthritis and struggled with walking and many simple daily tasks for years. I started utilising the suspension trainer to support her through lunging and squatting patterns and over time she gradually gained enough strength and freedom of movement to allow her carry out daily tasks almost pain free. She has now managed to get back to many of her hobbies including hill walking. Suspension training is often to referred to as TRX training, but like iPods or hoovers this is just one brand within a range of available products. Suspension training is basically a versatile system using straps for body weight exercises. What makes suspension training so great is the hundreds of different exercises that can be performed on the straps. When working with the straps you are forced utilise the body as a more integrated system. Due to its unstable nature training on suspension straps will challenge joint stabilisers more than traditional types of resistance exercises and almost every exercise performed involves a degree of core stabilisation and recruitment. Suspension training is simple to use: they can be used in one to one or group sessions and can be a great piece of equipment to have on your gym floor. By simply changing the angle of the body position you can progress or regress an exercise. This makes it very easy to overload a client at an appropriate level. The simplicity of changing intensity in this way also means don’t need to have several different weights available for different fitness levels within your class. Another major positive about suspension straps is that they can be used in almost any area. Clients who travel, work from home or are generally pushed for time can put them on their hotel door or from a tree in the park and get a great workout that fits around their life. I personally took these to a villa in Spain last year and used them this way and got a workout every bit as good as I would at a well-equipped gym! 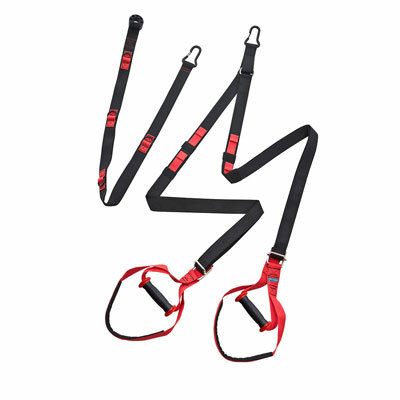 If you are considering in buying suspension straps for your gym, I would recommend purchasing an A-Frame or Functional Rig as these allow for optimal movement in all planes of motion and provide a secure and safe place to hang your straps from. If space is an issue you can purchase wall or ceiling anchors to hang the straps from, but this may limit you from performing every exercise available. The anchors should be placed approximately 80cm and 1.75m. If being used in a hotel or bedroom door attachments come with your straps. In an outside setting make sure you are attaching them to a safe solid fixing and always weight check them before use. As great a piece of equipment as these are, if the straps are placed in your gym without providing your members clear instructions on their use, they will only be used sparingly for a few basic exercises by your more confident gym users. Offering taster sessions is a great way to make your members aware of this new and revolutionary type of training. These sessions can help members gain confidence on how to set up and use the equipment and allows you to show them the endless benefits and possibilities the straps can provide. Place some information and posters on the wall to give your members some ideas and benefits of using the straps. Unless your staff are fully confident on how to utilise the straps and have a wide range of exercises in their tool box, they will not be confident on the straps and at best will half-heartedly show a few basic exercises to your members. I cannot recommend suspension training enough, and strongly suggest that your gym get onboard and make the most of this amazing piece of gym equipment. You will be amazed at how versatile they are and how great a workout they can provide. This entry was posted in Gym Owners Advice on 24th December, 2013 by Paul Murphy.